Entertaining without being compelling, a romantic comedy that is a little bit different and a little bit out there. Benny and Joon is not the same old romantic comedy, and yet it does kind of feel like we’ve seen it before. Girl lives with older brother after their parents die. Girl has mental issues. Older brother thinks he is the only one who can take care of her. We get lines like, “I’m the only family she’s got,” and things like that. Mary Stuart Masterson and her older brother, by Aidan Quinn, play the girl. Both actors were fairly big in the nineties and both have long since lost their fame. That’s because these were the kind of actors who always played back-up characters to the ones who were the real highlights of the film. In legends of the fall, brad Pitt played the wild card character and Quinn played the safe guy. Here, Johnny Depp has the catchy, eccentric role, and once again, Quinn is relegated to Mr. normal. Depp plays a uniquely strange individual who wants to be the next buster Keaton. When we first see him on a train, at the beginning of the movie, he is reading a book called, “how to act like buster Keaton.” and throughout the film, he does funny, silly things that impersonate the silent movie star. And Depp is great at it. But the movie doesn’t really bring him into the plot until at least thirty minutes in. that means for the first thirty minutes we are just with Quinn and Masterson, (Benny and Joon), watching the two of them together, watching Quinn (Benny) at work as a mechanic, watching him play poker with his friends, and watching him talk to the woman who runs a mental hospital / group home about the possibility of Joon needing to live there. It seems like a mistake that the movie holds off for so long on brining in the Johnny Depp character, Sam. That is because once he does get more than a second on screen the movie suddenly becomes fun. It’s a welcome change and maybe the move wasn’t a mistake, but that Sam was only as fun as he was because the movie took it’s time introducing him, carefully setting his character up. When Joon and her brother drive over to Benny’s friend’s house for poker night, Joon spots Sam sitting up in a tree. This and the train moment when he was reading the book are really the only two times we see Sam until he is given a real introduction thirty minutes in. 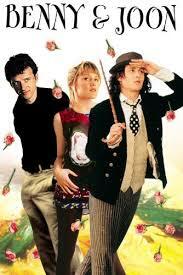 In addition, by that point we have spent time with Benny and Joon and know them and their situation. We are now freed up to focus on the Sam character and give him our full attention. In addition, he definitely deserves it. Depp is by far and away the highlight of this film. There’s a reason why he’s the one, of the three of them, who is still big today. There is a reason why his career has gotten bigger and bigger. He is an eccentric actor, and for a while, took roles very similar to this one, playing quiet outcasts in movies such as Edward Scissorhands. Once in a while he would play a character that was a little louder and wilder, such as the strange movie director in Ed Wood. And then he found captain Jack sparrow in the pirates of the Caribbean movies, a role which captured all of Depp’s eccentricities while providing him with a big budget large scale picture to show them off for. In Benny and Joon, you can see that Depp has some real potential. Sam is a great character, but working him into the plot seemed to be a challenge for the screenwriters. The vessel for bringing him in is a poker game. Joon plays in the game with Benny’s friends one night while Benny is away, and the way these guys play is they offer up things that they do not want into the pot. It is somewhat stupid. They offer up used items. Who wants that? But it gets us to a place where one night when the stakes are raised extra high, they start offering jobs that their opponents can do, like come clean my house, or shackle my roof. In addition, one of the guys offers away his annoying cousin who has been staying with him. “If you lose, you have to take him off my hands.” Joon loses and now Sam is signed away to live with them. I cannot believe they would have let the guy who made the deal get away with this. Joon is clearly mentally handicapped, and playing in a game with her is not the time to be raising the stakes higher than ever before. Talk about taking advantage. However, it gets Sam to live with them and now the second part of the story begins. Sam is a strange guy who is out to entertain and make people laugh. When they first meet him, he has taken the hubcaps off his cousin’s car and is spinning them around into the air. He has another scene where he slides around the house on a chair cleaning the place. In addition, at a diner they go to, he sits at the counter playing with rolls, making them dance around like feet. Sam becomes the housekeeper, or babysitter for Joon while Benny is away at work. He freaks her out at first, but then she starts to get used to him. Sam and Joon start falling for each other. The romance moves quickly, so that one moment they are just friends and the next they are kissing. In addition, one day while the three of them are out, Sam does one of his routines on Benny, starting with a hat that he cannot keep on his head. This turns into him shaking Benny’s hand and pretending the two of them are glued together. Soon Sam is flipping and flopping all over the place and has a huge crowd watching him and laughing. He is a natural and Benny is blown away. He gets a friend who is a talent agent (William H. Macy) to say he will come by and sees what this Sam is all about. That is when Joon looks at Sam and says she has to tell Benny the truth. It is understood that they tell Benny they are together, Benny gets mad, and that spins us out into the final act. Joon finds herself getting committed after a freak out and Benny and Sam must rescue her from the institution. It’s a little much, like something out of an action movie, but I guess that’s what a cliMax is for. It’s the time to raise the stakes. In addition, that is exactly what happens here. There is also a romance with Benny and a waitress at the diner, played by Julianne Moore, and Benny seems to intentionally sabotage it until the end of the movie. It is like the only reason that relationship is not working is so at the end of the movie Benny can show that he has changed, that he has learned something, and then we can get a successful conclusion. It is superficial and a wasted plotline. Benny and Joon is an entertaining movie, but it is far from great. The first portion is a little slow and the last portion is a little silly. In between, we get Johnny depp acting like a quiet, strange, lunatic and having fun doing it. His buster Keaton acts is absolutely the best thing about this movie. From his slide behind the counter at the diner to his chasing after the hat routine, he gets all the big laughs. However, other than him, there is not really anything special about this movie. It is an okay film. Not bad, but far from anything great.